Rances Barthelemy Discusses His Showdown With Robert Easter Jr.
2018 was an up and down year for Rances Barthelemy (27-1, 14 KOs). He suffered his first defeat at the hands of Kiryl Relikh. He did however, bounce back nine months later with a third stoppage win over Robert Frankel. 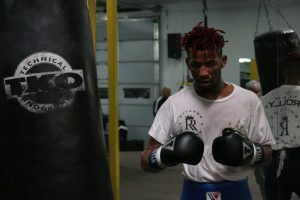 On April 27th 2019, Barthelemy will drop back down to the 135 pound division where he has won a world title before to take on another former champion in Robert Easter Jr (21-1, 14 KOs). Not only will this contest pit two fighters who are near the top in the Lightweight division but it also gives both fighters a chance to walk away with not just one but two world titles as the vacant WBA and IBO titles will be up for grabs. Barthelemy has always prided himself in facing the best opposition possible. Bouts against Denis Shafikov, Mickey Bey and Antonio DeMarco have proven that. When he enters the ring against Easter, it will be yet another opportunity for Barthelemy to showcase his skills against an opponent that he feels is amongst the best in his weight class. “I consider him amongst the elite of the division.” Said Barthelemy during his interview with Boxing Insider. The loss to Relikh, was some what of a shock. Never before had we seen Barthelemy struggle with an opponent to that degree. Barthelemy was able to shed a bit of light on exactly why he struggled during the course of that fight and the part inactivity played. Prior to his fight against Relikh, Barthelemy was out of the ring for close to one year. It was also just his second contest at 140 pounds. Although Barthelemy did not want to come back down to the Lightweight division, the opportunity was too good to pass up. There is still something special that the former champion wants to accomplish when it is all set and done. With Barthelemy officially making the land of 135 his home once again, he gave his take on current WBC champion Mikey Garcia’s attempt to dethrone Welterweight champion Errol Spence Jr just a few weeks ago. Come April 13th, Barthemely will be eager to prove that he is still a world caliber fighter. If you believe that his minor setback would cause him to doubt himself, think again.